Here is a card to welcome new twins. 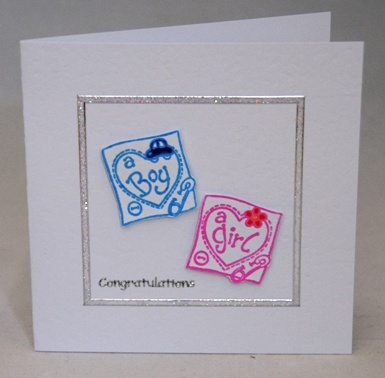 The card shown is to welcome a girl and a boy but it is also available for two boys and two girls. Two little cameo pictures – one for a boy with a little car and one for a girl with a little flower – sit proud of the card and are framed by silver glitter lines. Congratulations is written in silver and the card is blank inside for your own message. Please let me know which twin combination you would like at the checkout. If ordering by phone, please reference card #470.